Ladies (and gentlemen), please welcome guest blogger number two - Steffels! I'm so very excited to have Stef guest posting on my blog. Stef, just like Kristy yesterday, has created many a lemming for me with her stunning photos and perfectly manicured hands. I remember seeing Stefs Lynnderella manis many many months before I ever got a bottle and I would drool endlessly at them. Stef is the goddess of glitter nail polish photography - seriously have you seen her glitter swatches? Stef..show em what you've got. Hello! I'm so happy to be here for you today on More Nail Polish. Cathy is such a sweetie and I'm super excited to be doing a guest post for her. I pulled together bits and pieces into a spam post... I hope you enjoy it! Australis Here Today Gone Tomorrow. Deep green jelly. Absolute perfection. One of my favourite greens ever. I bought... a fair few backups when I found this on clearance at my local Priceline. Lush Lacquer Pink Panther over Mode VIP. Not sure if the grey was such a great choice but I do recall enjoying this manicure. TBN Blue Fluoro. Amazing two-coater sky blue creme. I use this quite often for layering. Halloween manicure from October. The green is Precision Honey-Dew This, the orange is CoverGirl Candy Corn and the purple is OPI A Grape Fit. Lynnderella Change over Missha HWH01 and Revlon Powerpuff. Change is so magnificent. I couldn't resist adding it to what was supposed to be a palate cleanser mani. DR 115. Glowy metallic teal. So beautiful but it stinks to the high heavens. Smells like you are painting your nails with toxic waste.... worth it though. Elevation Polish Pic de Sotllo stamped with fauxnad M72. The blue is a little off. Think Baker Street but more saturated. 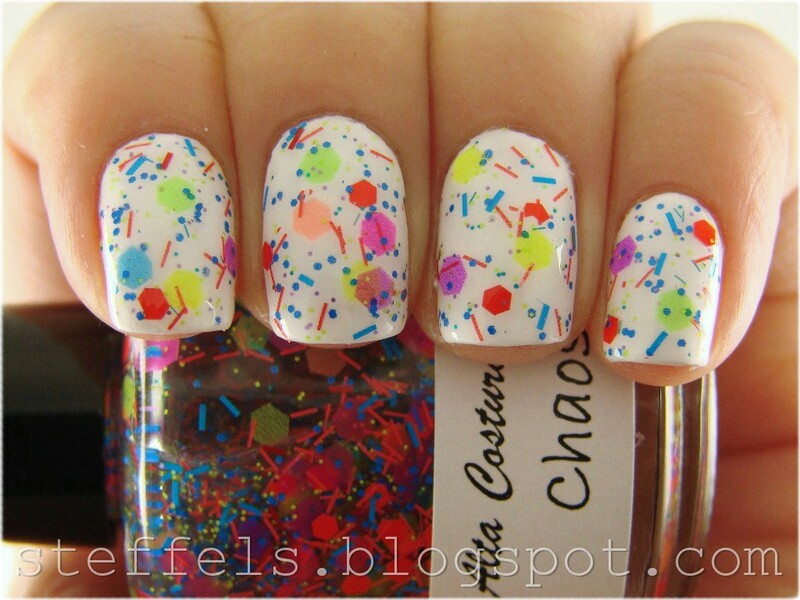 Alta Costura Vernis Chaos over white. Chaos is right. It looks like the 80's threw up on my nails. Awesome. Did I say Stef was the goddess of glitter nail polish photography already? See, she has done it again, I need to get Alta Costura Vernis Chaos now! 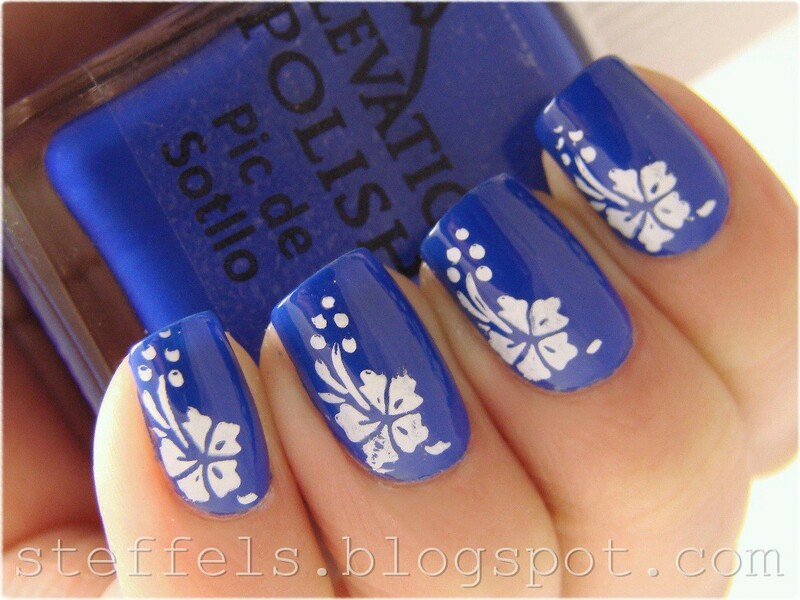 Thank you Stef, and especially for showing such an amazing array of polishes in one of your signature 'spam' posts! Please go and show Stef some love over on her blog - Steffels. *drools* I will have to pull that Australis out of my swap box! Looks so good!
" 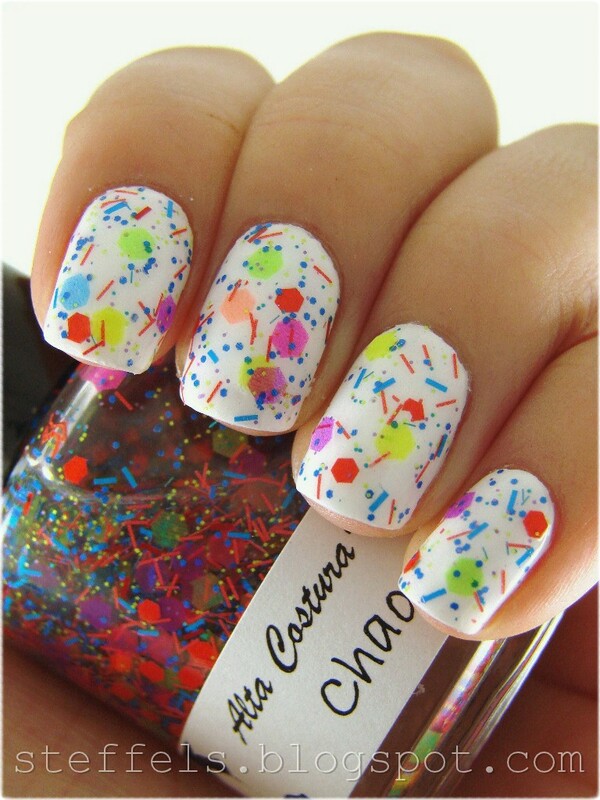 See, she has done it again, I need to get Alta Costura Vernis Chaos now!" i love the blue colour tint at TBN Blue Fluoro, wow!!! !